The 5DT Data Glove 16 measures finger flexure (2 sensors per finger) as well as the abduction between fingers. The system interfaces with the computer via a cable to the serial port (RS 232 - platform independent). It features an autocalibration function, 8-bit flexure and abduction resolution, extreme comfort, low drift and an open architecture. The 5DT Data Glove 16-W is the wireless (untethered) version of the 5DT Data Glove 16. The system interfaces with the computer via a radio link (up to 20m distance) on the serial port (RS 232). (No tilt sensor) Support for VR world building programs including Themekit VREK, Superscape VRT and Sense8. 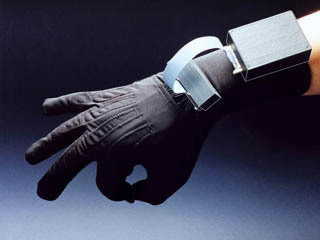 A body instrument package developed specifically for the 5th Glove. It converts finger flexure and hand orientation to music using MIDI commands, which can the be played out by any MIDI device e.g. a sound card. A virtual piano, horn, trumpet and drum set are already available as input controls which can be mapped to any MIDI instrument existing on either your MIDI compatible sound card or external synthesizer. A utility that emulates a standard Microsoft serial mouse on the hardware level. Default hand gestures have been defined to emulate left and right button clicks as well as double clicks. The glove will retain any user defined gestures and continue to operate as a mouse until the power is cycled. Demo program illustrating some of the applications of the 5th Glove. This program utilizes a 3-D manipulation scheme which enables a user to navigate a virtual world and to manipulate objects with gesture recognition. Windows (3.x, 95, NT) API Libraries and sample C/C++ code. Drivers for existing VR programs including Superscape VRT, Sense8 (now native), Themekit (native). DOS drivers/sample programs - 16 and 32 bit. Diagnostics utility that graphically displays raw flexure and pitch/roll information. Glove Fitting Right & Left Hand versions; "One size fits many"
Software Bundled Windows 32 bit DLL w/installation routines, Mouse Emulation, Raw Data Viewer, polygonal graphics hand model with C++ source code, KineMusica MIDI output program.